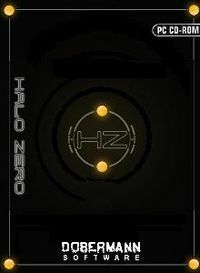 The cover of Halo Zero. Halo Zero is a fan-made 2D sidescroller shoot 'em up PC game created by Dobermann. The game was released to the public via hosting servers on December 12, 2005. The game's plot is loosely based on the Battle of Reach, before Halo: Combat Evolved took place. The game is not endorsed by Microsoft, Bungie, or 343 Industries; and thus, is considered non-canon. The game takes place during the Battle of Reach, the Master Chief fights his way through waves of Covenant forces invading the "Complex". At the end he is picked up by a Pelican, but later shot down. After wandering through a forest, he finds a Warthog. At the end of the ride he gets out and stops a Covenant bomb from destroying a generator. Once the bomb is disarmed, Vice Admiral Whitcomb sends the Chief a transmission saying he's a prisoner on a Covenant ship. Once the Admiral is rescued, the Master Chief goes to CASTLE Base and saves Sergeant Johnson, who stole an artifact. Together, Johnson and the Chief fight against the Covenant forces until a Pelican arrives to pick them up, carrying them to safety. Throughout the game all characters call the Covenant "Covenants". The Covenant ship featured in the game was referred to as the "Truth and Reconciliation". The main menu of Halo Zero. The game had a campaign mode and multiplayer mode. Campaign mode had five difficulty settings, Easy, Normal, Heroic, Legendary, and Mythic. Mythic difficulty would be unlocked by finishing the game on all other difficulties. The keyboard arrow keys were used for movement, and the mouse acted as a free look, while the left mouse button and the right mouse button shot and threw grenades, respectively. All other functions such as melee, Switch Weapon and Jump were subject to be changed by the user, but the mouse controls were unchangeable. Multiplayer maps were based off of existing Halo multiplayer maps such as Zanzibar and Blood Gulch. A screenshot of the Level Editor. During the summer of 2004, just before the release of Halo 2, screenshots of the relatively unknown Halo Zero were sent around the Internet ostensibly as proof of an upcoming Halo game for the Game Boy Advance. On May 31, 2009, the official site and therefore server of Halo Zero was deactivated due to a lack of money to continue to keep the site running. Halo Zero 2 was a planned but never completed sequel to Halo Zero, apparently incorporating some of Halo 2's new features, such as the Battle Rifle and the SMGs. The first version of Halo Zero 2 resembles the gameplay styles used in Metal Slug. Later in the production phase, Halo Zero 2 returned to the design previously used in Halo Zero. The Halo Zero 2 project was eventually put on hold indefinitely, later cancelled due to the bandwidth costs of maintaining the game site and having no funds to pay it. A screenshot of Halo Zero's gameplay. A screenshot of the Alpha-build of Halo Zero 2. Gameplay style was similar to that of Metal Slug. A screenshot from the canceled Halo Zero 2. ↑ Dobermann received permission to use contents from Halo: Blood Covenant for Halo Zero.